In any industrial plant, inspection and minor maintenance work are taking place “on line” but it has to undergo a scheduled process outage for the major maintenance work and this outage is referred to as “plant shutdown”. Turnaround management is primarily concerned with repair, replacement, alteration and refurbishment of malfunctioning items. A turnaround is a cyclical process with four phases which starts with initiation and passes through preparation, execution and termination. The initiation phase of the next turnaround must follow on from the present termination phase. 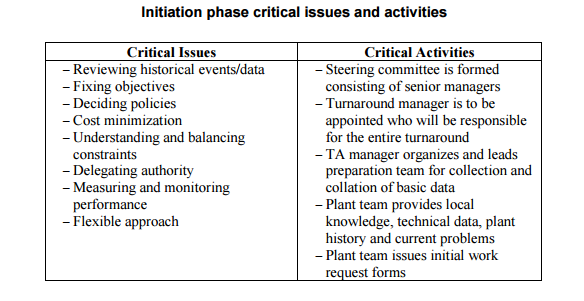 The initiation phase of a turnaround starts from the moment the senior manager considers the necessity of the turnaround and continues over a period of months. In some cases it continues for 20-24 months before the event. During this phase all parameters of the turnaround are defined in detail i.e. analyses breakdown and production problems from the historic data and past events. Strategic issues and objectives are addressed in this phase. Some of the critical issues and activities are tabulated below. 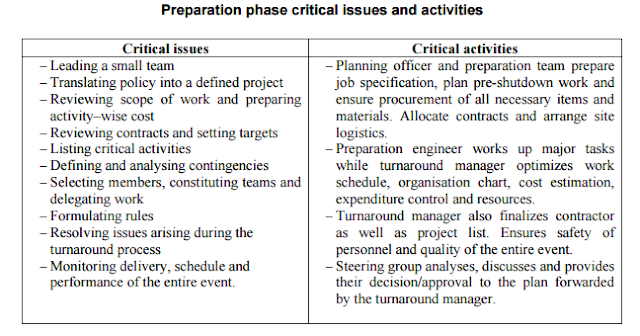 Preparation is the most important phase of the turnaround process and may continue for a period of 3 to 18 months depending upon the scale of the event. Members of the preparation team accumulate a large quantity of technical and non-technical data to specify, schedule, resource and cost the large volume of tasks required to execute the turnaround event by validating and transforming those data into a set of plans. The work list is one of the most important elements of this phase and is the foundation of safety, quality, costs, equipment, materials, resources, logistics and turnaround duration. It contains an element of uncertainty as it involves some degree of prediction of the unforeseen activities related to plant equipment that can be minimised by systematic questioning as a part of an analysis of contingencies. Some of the typical questions used for the analysis are: What may go wrong? What faults are likely? What is the cost implication? How much time is required to set that right? What are the contingencies available? The preparation team along with the plant team challenges and validates the work list that is finalised by the turnaround manager. The plant team and TA team have to communicate regarding the requirements of the turnaround from time to time by means of a series of briefings involving each and every person across the levels. During the execution phase all the planning and preparation are tested against reality and is characterised by the performance of a large number of people of different skills and disciplines within the framework of restricted money and time. Execution continues two to eight weeks, which involves co-ordination of all activities. It is characterised by close monitoring and controlling of event-wise schedule, safety, quality and cost. The termination phase continues one to two weeks during which time the entire turnaround work is closed and performance is to be reviewed against the plan. It includes reviewing of all completed jobs and re-commissioning activities to ensure safety. • Start-up team cleans the site and removes all equipment especially brought for turnaround work. 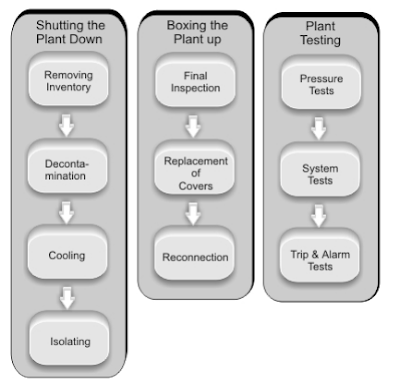 • The plant manager takes charge of the plant after thorough inspection while the turnaround manager demobilizes the start-up team. • De-briefing can be arranged jointly by the plant and the turnaround manager. • The turnaround manager generates the final report. 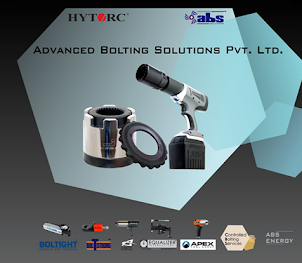 ABS holds competence in managing complex situations like Plant Turnaround & Shutdown Maintenance with utmost precision, speed and safety.ABS successfully executed shutdown projects of Reliance Industries, CPCL, BPCL,IOCL, MRPL, HMEL, GE International etc.